Richard is a very experienced, entertaining, and inspirational public speaker. He is as comfortable with intimate specialist groups as he is with very large audiences. His casual and informal presentation style allows him to communicate complex ideas without overfacing his audience. Lectures can be tailored to suite the needs of a group. - Dressage Technique - Do with your own body what you would like your horse to do. - Training - Make a little bit from you mean a lot to your horse. Often a lecture is a good way to introduce a subject. It does not replaced practice or lessons, but it does offer an opportunity to broaden the perspective and have a bit of fun. Richard's lectures aim to entertain and educate. - General interest Clubs such as Service clubs ie. Rotary, Probus, Lions etc. Richard has worked in lounge rooms in front of a dozen people and at huge events with an audience of thousands and every where in between. According to the occasion. Around two hours in a suitable setting with an interested group. If amplification is necessary a lapel microphone is preferable. A public lecture/demonstration is a thorough presentation tailored to the needs of a group in which theoretical information is supported by activities. Some audience participation may occur to aid in the understanding of a subject which involves the feeling senses. Techniques right and wrong are also demonstrated for the audience either by Richard or by selected participants. Richard's Lecture/Demonstrations are highly entertaining and educational. They aim to bring a heightened awareness of the subject by combining theory with sensory and informed visual experiences. - Seminars and large events. - General interest Clubs such as Rotary, Probus, Lions etc. Lecture/Demonstrations are specifically designed to meet the needs of the group. 10.00 ï¿½ 11.00 Lecture outlining the features of coordination described in the German Training Scale and how each feature can be influenced by the rider. 11.00 - 11.30 Six demonstration riders come into the arena together and take their own line. The audience assesses the riders according to special guidelines relating to balance and co-ordination. Four or five of the riders are selected for further scrutany. They come in sequence, one at a time. 11.30 ï¿½ 12.15 Rider No1. Is guided to demonstrate balance and rhythm issues. 1.00 - 1.45 Rider No.2 Is guided to demonstrate Suppleness and Lengthening issues. 1.45 - 2.30 Rider No.3 Is guided to demonstrate Impulsion issues. 2.45 - 3.30 Rider No.4 Is guided to demonstrate straightness and collection issues. 3.30 - 4.00 Discussion/Question and Answer time. NB times are approximate. Each rider is ready to come in as the previous rider finishes. - An indoor arena with adequate seating and lighting. - Moveable Mounting block or suitable stool for standing on. - A spare dressage saddle. Variations on this format and theme have been presented for the German, Dutch, Australian, and New Zealand Equestrian Federations and at many major international events. Successful dressage training depends entirely on the riders ability to communicate complex requirements to the horse. Dressage implies a particular way of doing things. They might think they have, but most horses haven't read the books on how it should be done. Developing the communication skills needed to train a horse to work in a relaxed, obedient, supple, energetic,balanced way is essential to all riders. In Dressage Horse Training Demonstrations Richard shows work in-hand, on the longe and at liberty using his Oldenburgers Ming and Chello. Supplied horses are sometimes used to show early training and control techniques. All techniques including work at liberty are based on the postural mechanics used for dressage horses in the competition arena. Liberty work and longing clearly demonstrate just how natural correct posture is. The right posture in the horse is a response to the demands of the work providing tensions and resistances do not interfere..A progressive system for developing obedience and trust is used to improve the posture, balance and movement of the horse without the weight of the rider. To give riders a deeper understanding of how a dressage horse develops the skill of carrying a rider in a seemingly effortless way.And to show trainers a variety of tools to help the horse through the tricky business of pefecting efficient rider carrying skills. Horse training is never for the faint hearted but Richards Dressage Horse Training Demonstrations can be encouraging for riders and trainers who enjoy to work with, rather than against their horses. Demonstrations can also be very entertaining and informative for non-riders who enjoy to know what goes into producing a beautiful harmonious looking dressage pictureï¿½.lonely husbands showing an interest, anyone with a teenaged granddaughter for instance? 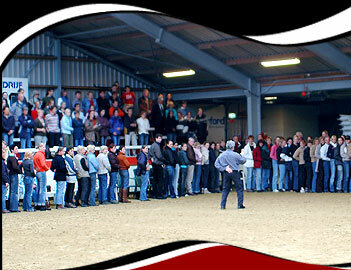 A well lit indoor arena or venue with a good dust free, non slip, working surface and comfortable seating arangements.